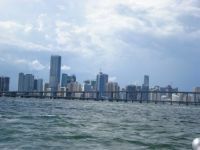 The City of Miami has a well organized system of transportation which allows locals and tourists to move from place to place without a problem. The Miami-Dade transit department has a metrobus and metrorail system running daily and under a timely schedule. The Miami transportation bus system covers Miami-Dade County from Miami Beach to West Miami-Dade and from the Middle Keys to the southern portion of Broward County. Every Metrobus stop has a sign followed by the route numbers of the buses that pass by. First, you should make sure to wait by the correct stop for your safety, and get on the right route which appears on the windshield of the bus. Failure to carefully pay attention to this, might cause you to end lost somewhere else. For a complete listing of metrobuses, stops, routes, and schedules, go to: www.miamidade.gov/transit/routes1.asp. With over 20 metrorail stations, the Miami Metrorail runs from Dadeland Station South to Palmetto Station crossing main areas of the City of Miami such as Coral Gables, Downtown, and Hialeah. The Metromover is free and convenient when getting around in downtown. There are 20 Metromover stations about 2 blocks apart, and they are great for attending games at the arena or simply promenading through Bayside Marketplace, a popular Miami attraction. Miami taxi cabs are found everywhere ready to provide transportation services to and from any destination. They are available throughout the City of Miami with only a hand wave or a call. Taxis in Miami can take from your Miami Motels or Miami Beach vacation rental to any place you want. Car rentals in Miami have a variety of vehicles which makes transportation easy and enjoyable. You can rent a car for a single day or for a whole month. Taxi cabs are the best and most effective mode of transportation for Miami tourists... find a listing of the taxi cab companies in Miami. Enjoy the Miami transportation system with the metropass and freely travel through the city of Miami using the metrobus and metrorail systems. The SunPass in South Florida is an innovative Prepaid Toll Program that can be used on most Florida toll roads. Vehicles with at least two people on board can access the faster and less congested Florida HOV lanes. Miami vacationers hoping to explore other parts of Florida may choose from numerous ways of travel between cities.